The founders of the Facebook group claim that they got the idea for the page from the recent uprisings throughout the Middle East that led to the ousting of the Tunisian and Egyptian leaders and the fall of their regimes. There is no need to explain what the outrageous incitement on the page in question can cause – from harming innocent Jews and Israelis and through to an armed struggle against Israel, Minister Edelstein wrote in a letter to the founder of the popular social network. In his letter, Edelstein stressed that he wasn’t writing in his official capacity but as someone who shares the values of freedom of expression, and said he believed that there must be a discernable difference between freedom of expression and freedom to incite. The founders of the group hope that a popular uprising like those that broke out in the Arab world would also bring about the downfall of the State of Israel, with the help of groups supporters in the Palestinian Authority and countries bordering on Israel. The group’s doctrines include a call for simultaneous protests on the Jordanian, Egyptian and Syrian borders while Palestinians from the West Bank and Gaza will launch attacks on Israeli settlements. Moreover, they ask for “the help of our brothers in Lebanon” who will assist by raining missiles down on Israel. 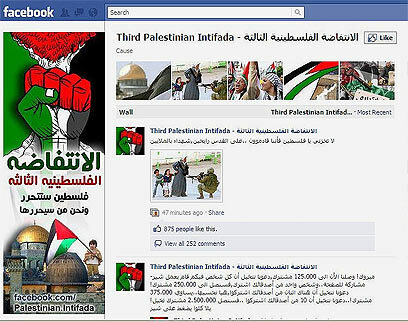 Since its launch, the Facebook group has received a great deal of coverage in the Palestinian and Arab media. Its founders, who remain anonymous, warned Facebook that shutting down their page would lead the Muslim world to boycott Facebook. It seems that the threat did little to impress the site managers as one of the group’s founders who calls himself “Son of Palestine” reported calls for violence. Son of Palestine also accused Facebook’s management team of forging the number of supporters the group has, claiming that the number is much higher than 250,000. It looks as though Israel has decided to take the initiative to stop any initiatives to reach a Palestinian national unity. First, the Israeli government continues to shrug off external pressure to end the imposed siege on Gaza, which has entered its fifth year. Second, it continues to slight the new Arab democracies, especially the Egyptian one. Finally, it continues to block the road to an imminent Palestinian state, which could be accomplished by September. Israel’s latest military escalation on Gaza is a clear indication of its intention to escape all commitments and once again cast itself in the role of the victim, accumulating solidarity from foreign nation—something that we grew sick of a long time ago. Israel knows that whenever they kill people in Gaza, as they have in the past few days, unrest will not settle down any time soon. And it is certain that the ensuing escalation only benefits Israel. The Jerusalem bombing, in which a bomb was left at a bus stop in West Jerusalem, killed one and injured 30. I have no doubt that Israel did this. There is no evidence that Palestinians perpetrated the attack. The attack had no repercussions; the army didn’t even impose a blockade on the West Bank and we haven’t seen Israeli countermeasures common to every Palestinian attack. The government’s attempts to use Itamar attack—in which a family of five settlers were killed by an unknown assailant—as a weapon to attack Palestine and its leaders has been unsuccessful, simply because there is no decisive evidence who carried out the murders. The Israeli public should be aware of what their government is doing, and in which direction it is heading. The public should know that this will not end the international pressure on Israel to end its occupation, nor will it jam Palestinian reconciliation for very long. Considering what is it planning to do, this government might lead to things that no Israeli citizen wants, especially in light of the rabid changes sweeping the region, which has a clear impact on Israel’s relationship with its neighbors. Israel must be much clearer with its people, the Palestinians and the world; it has to admit in a clear voice that it wants to maintain the occupation and eschew peace. It was not interested in the 2002 Arab peace initiative nor the recent superficial peace negotiations to escape its suffering from hardline positions on everything. Israel must understand that giving the Palestine the choice between peace and Hamas does not interest us. No one doubts that Palestinians want peace, because we are the ones under occupation and we continually demand freedom. Israel, it is time for you to stop using security issues to hamper peace. Haven’t you had enough of military checkpoints, barbed wire, and walls over land and sea? And you want the world to believe that we are the ones responsible for the Jerusalem bombing? Or that we terrify and want to eliminate you? Time has come for you to rethink your strategies and evaluate your policies that have led you to war rather than peace, bloodshed rather than life. Time has come for you to decide whether you want your futures government to live in peace with the Palestinians and the surrounding Arab world—to end this shameful chapter of humanity as a whole. The fundamental teachings of Moses, Jesus and Mohammed (pbut) are the same. The first commandment given to Moses (pbuh) was the Shama or Kalima, as Muslims would have it. 112:1 Say: He, God, is One. If we read these verses in Hebrew or Arabic, the root word ‘One’ in Hebrew is “Ikhad” and in Arabic it is “Ahad”. Aramaic, Arabic and Hebrew are sister languages. Therefore, Moses said “Ikhad”, Jesus said “Ikhad” and Mohammed said “Ahad”. Meaning “One”. If we are to believe in “ONE” God, than why God sent Moses (pbuh) with ‘Judaism’, Jesus (pbuh) with ‘Christianity’ and Mohammed (pbuh) with ‘Islam’? If we are to follow the religion known as “Judaism” than this religion is not mentioned anywhere in the Law (Torah) (Old Testament) or Talmud or any other scriptures claimed by Jews to be the word of God. Nor did Moses (pbuh) in their sacred scriptures told his followers that their religion is “Judaism”. Where does this word “Judaism” comes from? Palestine was divided into tribes, one of them known as “Judea”. Therefore, the religion followed by the children of Juda in the land of Judea is known as “Judaism”. If we are to follow the religion known as “Christianity” than this religion is not mentioned anywhere in the Bible. Nor did Jesus (pbuh) told his followers that your religion is known as “Christianity”. There are 73 books in the Catholic Bible and 66 Books in the Protestant Bible, But no word such as Christianity is found in them. The word “Christianity” is actually a derivation of people who after the ascension of Jesus (pbuh), accepted him as their Messiah. It was first used in Antioch. Acts 11: 25-26 “Then Barnabas went to Tarsus to look for Saul, and when he found him, he brought him to Antioch. So for a whole year Barnabas and Saul met with the church and taught great numbers of people. The disciples were called Christians first at Antioch. If Christians believe that Jesus (pbuh) was their Messiah and the Bible is the word of God, than they must realize that no where does God says in the Bible to be Christians or no where does Jesus say in the Bible to be Christians. The Arabic word Islam is derived from the root word Salam or Shalom in Hebrew, meaning peace. The word “Islam” means Submission to God. Therefore, Muslims are those who submit themselves to God. This word is not only found in the sacred scripture of Muslims known as Koran, It is also found there in the Bible. 3:20 But if they dispute with you, say: I have submitted myself entirely to God and (so) every one who follows me; and say to those who have been given the Book and the unlearned people: Do you submit yourselves? So if they submit then indeed they follow the right way; and if they turn back, then upon you is only the delivery of the message and God sees the servants. Therefore if we had the chance of meeting Moses (pbuh) and would ask him, what is your religion (way of life)? He would say my religion is Submission to God (Islam). If we would be alive till the second coming of Jesus (pbuh) and would ask him, what is your religion? He would say my religion is Submission to God (Islam). If he would say I am a Christian, we will ask him, which church do you belong to? Or do you accept the extra 7 books in Roman Catholic Bible or not? If we ask a man of any religion that How many Gods do you believe in? His answer will be that God is One. For example a Hindu will also answer that God is One, but on the other hand he believes in God Incarnation! That God came to earth as Rama, Krishna, Seeva etc. The Christians would also say that we believe in One God, but they’ll say that God came on earth only as Jesus (pbuh) to live among us and understand us better. If that is so, why don’t you ask yourself a question? If God became a man to understand us better, why He didn’t became a Tree or a plant to understand it better? Why He didn’t became Sun to understand the Sun better? Why He didn’t became a Rabbit, to understand it better? If we create a camera, to understand camera do we have to become camera ourselves! Or do we as camera’s creators would already know how to make the camera work better. Just like that God is the Creator of everything that exists. To understand us, God doesn’t have to come in a form of human, But he sends a man, a Prophet to His people, so that they may believe in him with their God gifted brains and would live a life as God wants them to live. This takes us to the story of Adam (pbuh) in the Bible. It tells us that Adam and Eve were thrown out of the Paradise because of the Sin they committed. Imagine, Adam and Eve HEARD the VOICE of the Lord God WALKING in the GARDEN in the COOL of The DAY. GOD WALKING!!!!! JOHN 4:24 God [is] a Spirit: and they that worship him must worship [him] in spirit and in truth. In verse 9, the Creator of everything, The Greatest, The All-Knower, Is searching for Adam… WHERE ART THOU??? Christian theology tells us that the sin Adam & Eve committed, was inherited by everyone till the time of Jesus (pbuh). We ask, wasn’t kicking out of the garden enough punishment for them! No, says the Christian theology! Because of Adam and Eve, all mankind will pay for their sin! We would like to ask, Did Adam and Eve asked you before eating the apple? NO!!! Than how can the All-Wise, Master of the Day of Judgment would held you responsible for their sin? The theology says, that Jesus (pbuh) was Crucified to neutralize that sin. Can The Most Merciful God not forgive your sins without having Jesus (pbuh) crucified in such pain and difficulties? How then can man be justified with God? Or how can he be clean that is born of a woman?-(JOB 25:4). “..To whom then will ye liken God? Or what likeness will ye compare unto Him?”- (ISAIAH 40:18). “I am the Lord thy God…Thou shalt have no other gods before Me. Thou shalt not make unto thee any graven image, or any likness of anything that is in heaven above, or that is in the earth beneath, or that is in the water under the earth; Thou shalt not bow down thyself to them nor serve them.”-(EXODUS 20:2-5). Ye men of Israel, hear these words; Jesus of Nazareth, a man approved of God among you by miracles and wonders and signs, which God did by him in the midst of you, as ye yourselves also know.-(ACTS 2:22). I can of mine own self do nothing: as I hear, I judge: and my judgment is just; because I seek not mine own will, but the will of the Father which hath sent me. If I bear witness of myself, my witness is not true.-(JOHN 5:30-31). And, behold, one came and said unto him (Jesus), “Good Master, what good thing shall I do, that I may have eternal life?” And he said unto him, Why callest thou me good? There is none good but One, that is God: but if thou wilt enter into life, keep the Commandments.-(MATTHEW 19:16-17). How Mary Conceived and Delivered “God”. Mary conceived Jesus like any other woman: “The days were accomplished that she should be delivered,” (Luke,2:6) which means that she went through all the normal stages of pregnancy. 5:77 Say: “O people of the Book! (Jews & Christians) exceed not in your religion the bounds (of what is proper), trespassing beyond the truth, nor follow the vain desires of people who went wrong in times gone by,- who misled many, and strayed (themselves) from the even way. 5:75 Christ the son of Mary was no more than a messenger; many were the messengers that passed away before him. His mother was a woman of truth. They had both to eat their (daily) food. See how God doth make His signs clear to them; yet see in what ways they are deluded away from the truth! 3:67 Abraham was not a Jew nor yet a Christian; but he was true in Faith, and bowed his will to God’s(Which is Islam), and he joined not gods with God. Socialism in the 21st Century.. How feasible is that? Is it a Utopian dream as supporters of capitalism say? Is it something of the past as others charge? At a time when the world is faced with a global financial crisis that is the worst since the Great Depression, faced with increasing poverty, wars, famines and humanitarian crises, the fight for socialism becomes literally a matter of life and death for the planet and its inhabitants. The Center for Socialist Studies strives to be a platform for the dissemination of socialist ideas and politics, providing venue for those who want to change the world with the theoretical literature needed for this struggle. The Center produces a variety of publications (newsletters, books, magazines), holds public events and lectures in solidarity with the workers, peasants, students and civil servants. The Center does not receive any foreign funds from governments or NGOs, and instead depends on the contributions and donations from its members and sympathizers. The Center is located @ 7 Mourad Street, Giza Square. Vertegenwoordigers van het regime van de Libische leider Moammar Kadhafi en opstandelingen zijn vrijdag aanwezig bij een bespreking van de Afrikaanse Unie. Dat heeft VN-secretaris-generaal Ban Ki-moon donderdag gezegd. Het overleg in de Ethiopische hoofdstad Addis Abeba is erop gericht een staakt-het-vuren te bereiken en een politieke oplossing te vinden voor de crisis in Libië. De speciale VN-gezant voor Libië, de Jordaanse Abdelilah Al-Khatib, heeft de Libische regering gewaarschuwd dat de Veiligheidsraad bereid is ’extra maatregelen te treffen’ als zij de VN-resolutie – waarin wordt opgeroepen tot een staakt-het-vuren – naast zich neer legt. De Amerikaanse minister van buitenlandse zaken Hillary Clinton gaat dinsdag naar Londen voor een internationale bespreking over de coördinatie van de militaire operatie in Libië. Naast Clinton zijn ook de ministers van buitenlandse zaken van landen die aan de missie deelnemen aanwezig. But we know all the reasons why it did not, and will not happen. And yet we may have overlooked one particular reason, indeed one successful ploy of the Israeli peace camp that seems to have aborted any such effort in its buds. The liberal Zionists believe strongly in the existence of two discrete entities one Israel and one that lies on the other side of the 1967 green line which have very little in common. The acceptance of this line as a hard fact is the main justification given in the West for the inaction against Israel (one which is also supported by some of Palestine’s best friends and of course the Palestinian Authority). The line drawn is not just a political boundary it is mainly a moral border. Everything that is happening in the occupied world is diametrically opposed to life in democratic Israel and hence the argument is that if you treat Israel as a pariah state then you will also harm the ‘good’ part, the pre-1967 state. This is also the basis to the continued support for the two states solution that bases peace on the ability of moral Israel to re-invent itself in the pre-1967 borders. I hope this distinction would at least disappear from the vocabulary and dictionary of the Western solidarity movement with Palestine (where it can still be heard in loyalty to the peace camp in Israel, the PA and the invisible lord of realpolitik).That this distinction is false was proved once more this week (20 March, 2011) when yet another apartheid law was passed in Israel. This new law allows Jewish settlements built on state land inside Israel not to admit Israeli Palestinian citizens as residents and legalizes the wish of these new settlers not to sell land to the Palestinians citizens of the state. This is one of many such laws passed recently (the loyalty oath law that turns the Palestinians in Israel to second class citizens by law and one which does not allow them to live with their Palestinians spouses from the occupied territories are two of the more famous apartheid laws passed recently). The new law, like the previous others, institutionalize the Apartheid State of Israel or for short ASOI. ASOI is now one of worst apartheid regimes in the world. It controls almost all of Palestine (apart from Gaza which it imprisoned hermetically since 2005). It has, in absolute terms the highest number of political prisoners (China was reported to have less then 1000, Iran has few thousands); Israel holds nearly 10,000 of them. It has the largest number of apartheid laws and regulations than any country in the world and apart from the Arab regimes that are now collapsing and rogue states such as Miramar and North Korea, has the longest imposition of emergency laws and regulations that rob citizens of their most basic human and civil rights. Its policies against the discriminated native population, now composing nearly half of the overall population in ASOI, include atrocities such as barring people from using water sources, from cultivating their fields, building more houses, from getting to work, schools or universities and it bans them from commemorating their history and in particular the 1948 Nakbah. ASOI is protected by left wing philosophers, mostly Jewish but not only, in the USA and the West as well as by the new members of the European Union whose deplorable record during the holocaust may explain their unconditional support for ASOI. It enjoys the unconditional backing of many Jewish communities in the World, Christian Zionists and cynical corporations who benefit from ASOI’s military elite’s proclivity to use lethal weapons at will and from the state’s progressive banking system and a high tech know how. ASOI could become the Free Republic of Israel and Palestine (FRISP) or any similar name, where people would enjoy the same rights now fought for all over the Arab world and which the West claim to disseminate and protect all over the world. If ASOI will not become FRISP, any action such as the one taken now by the West in Libya would rightly be regarded suspiciously as cynical and dishonest. Linkage has lost it attraction since it was misused by Saddam Hussein in 1991. But now is the time to revive it. It is time to realize that there will not be a new Middle East – in fact, there will no world peace – if ASOI continues to enjoy immunity and is not curbed and stopped – and hopefully one day – replaced by the democratic FRISP. Ilan Pappé is a professor with the College of Social Sciences and International Studies at the University of Exeter in the UK, director of the university’s European Centre for Palestine Studies, co-director of the Exeter Centre for Ethno-Political Studies, and political activist. His books include A Modern History of Palestine, The Ethnic Cleansing of Palestine and Gaza in Crisis (with Noam Chomsky). Gaza, March 24 Thursday, In Gaza City, Israeli F16 warplanes bombed an intelligence headquarter named “the ship”, using at least five missiles, also raided the al-Rayes mountain with one missile and a room that belongs to “Gaza” sporting club, also “Badr” security HQ belonging to the Qassam Brigades, Hamas militant wing, with three missiles.